This PVP event is player 10 players versus 10. The 1st phase is called Iron Tabernacle. Its a pve phase and it is optional. In this phase players have to clear the stables and the Anvil from the elementals that are there and set them to work. Once they work, you must kill mobs and use their drop items in the stables or in the anvil. There is also a huge boss in the middle building called The Blasphemer. The team that will gather more points wins this phase. The 2nd phase is called Armories of Moradin. It is a pvp event and you have to do it if you want to continue to the next phase. To join the pvp battle you just press the Join button that will appear on the right side of the screen. Its capturing points pvp. It contains 4-5 cap points and the teams are 20 vs 20 players. Also some ppl that dont want to join pvp emediately can help with pve. You can go build Catapults and feed the Giant. If you alegiance wins, catapults and giants will help in pvp battle. 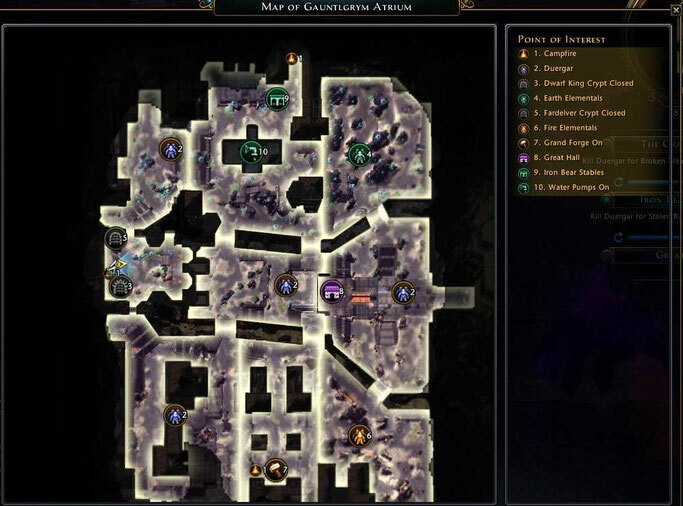 The 3rd phase is called Delzoun Crypts. There are 2 dungeons there. If your alegiance tottaly loses the GG event you can go only to Fardelver Crypts and get T1 drop item from boss and the chest. If your allegiance wins, the Dwarf King dungeon will be available for T2 drops. The chests also reward you with GG coins. Use these coins on the vendor in GG to get T2 pvp gear.